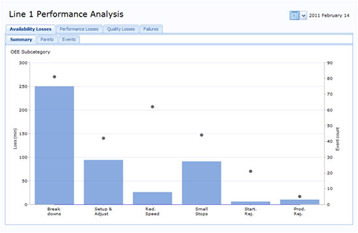 The Rockwell Software Performance Management Application enables manufacturers to increase enterprise productivity and reduce costs by using plant assets, materials and labor more efficiently. This is accomplished through real-time communication of operational KPIs and review and analysis of production performance and losses. Process Order Management - Create process orders and provide for optimum planning of each order. 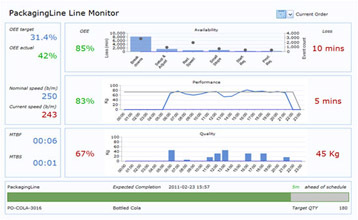 Performance Monitoring - Collect faults and production counts automatically from the control system or manually from production line operators. OEE Calculations and Loss Analysis Transform shop floor data collection into hourly summaries of Overall Equipment Effectiveness (OEE) and losses. Application Configuration and Administration - IExcel file nterfaces are provided to import several aspects of its configuration including plant model reason codes and material definitions. Application Interfaces - Support preferred integration with Rockwell Automation's ControlLogix platform using ControlLogix User Defined Data Type (UDT).